If you have found something new, unusual, severe, or unresponsive in relation to small ruminant diseases, please contact the SREG veterinary lead or your nearest Veterinary Investigation Centre. Please note: if you suspect a notifiable disease you must contact APHA immediately. Explore the diagnoses made by the GB surveillance network through the interactive sheep disease surveillance dashboard. The SREG veterinary lead is Amanda Carson (07909532229). Amanda has been the SREG veterinary lead since April 2014. She leads the Defra-funded small ruminant disease scanning surveillance project in APHA, and is a committee member of the Goat Veterinary Society and the Association of Government Veterinarians. 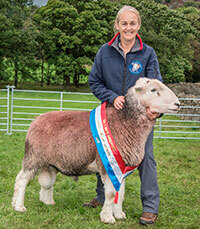 Amanda also represents APHA on the Sheep Health and Welfare Group. She is the vice chair of the Farmer Scientist Network of the Yorkshire Agricultural Society, a trustee of the charity The Sheep Trust, member of the Farm Animal Genetic Resources Committee (FAnGR) and secretary of the Herdwick Sheep Breeders’ Association. To support the SREG veterinary lead, the group has representation from Veterinary Investigation Officers from APHA and SRUC Veterinary Services representatives. In addition, there are APHA members on SREG providing expertise for specific disciplines (e.g. epidemiology, virology, bacteriology, pathology, field veterinarians and welfare) and specific diseases (e.g. parasitic diseases). There is also representation from those involved in International Disease Monitoring in APHA. SREG contributes interesting and unusual small ruminant cases, highlights small ruminant disease alerts or findings and provides focus articles relating to small ruminants for the APHA Veterinary Record monthly disease surveillance report. These are compiled together with contributions from other Species Expert Groups. Quarterly GB Small Ruminant Disease Surveillance and Emerging Threats reports are compiled by SREG. They summarise investigations into threats and other surveillance issues to inform governments, the veterinary profession and livestock farming industries of new or re-emerging threats to cattle health or changing trends among existing ones. GB small ruminant quarterly report: disease surveillance and emerging threats - April-June 2018. GB small ruminant quarterly report: disease surveillance and emerging threats - January-March 2018. APHA has provided more information on SBV cases in lambs confirmed by APHA in England and Wales during December 2016 and January 2017. This information will be updated to show new cases, by county, on a fortnightly basis.